Poster featuring a photograph of a woman in a flight suit, sitting in an airplane. She is surrounded by four men standing wearing dress uniforms, one of whom is holding a poster. 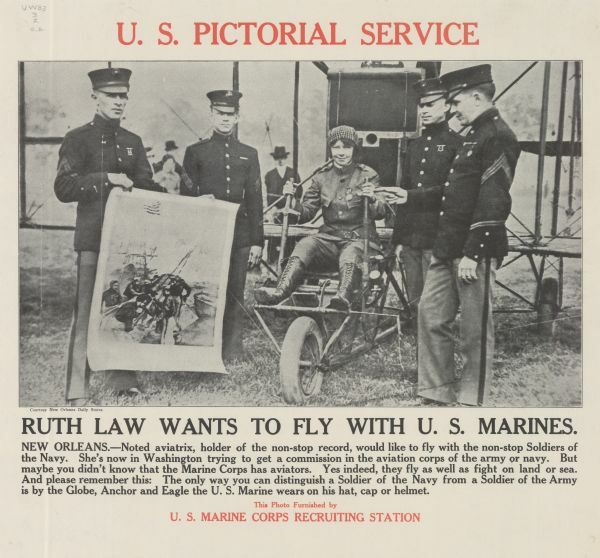 Poster text reads: "Ruth Law Wants to Fly With U.S. Marines. New Orleans. — Noted aviatrix, holder of the non-stop record, would like to fly with the non-stop Soldiers of the Navy. She's now in Washington trying to get a commission in the aviation corps of the army or navy. But maybe you didn't know that the Marine Corps has aviators. Yes indeed, they fly as well as fight on land or sea. And please remember this: The only way you can distinguish a Soldier of the Navy from a Soldier of the Army is by the Globe, Anchor and Eagle the U.S. Marine wears on his hat, cap or helmet. This Photo Furnished by U.S. Marine Recruiting Station." Photograph courtesy New Orleans Daily States.